Welcome to Americas Best Value Inn Montezuma/ GA/ located between Macon/ Fort Valley/ Albany/ and just over an hour away from Valdosta. Our exterior corridor hotel is near several historical sites including the Andersonville Civil War Village/ Andersonville National Historic Site/ Historic Marshallville/ and Jimmy Carter National Historic Site. We are also close to several colleges and universities such as South Georgia Technical College/ Fort Valley State University/ and Georgia Southwestern State University. A few of the restaurants located within a mile of our hotel include Huddle House and Carter-s Fried Chicken Express. Our two story hotel offers comfortable accommodations/ affordable rates/ and a friendly 24-hour front desk staff to help make your stay enjoyable. Start your day right with our free continental breakfast. Appreciate the convenience of our on-site barbecue area and guest laundry facility. Step into the privacy of your own guest room with amenities including a microwave/ mini-fridge/ coffeemaker/ flat panel cable TV with HBO and ESPN/ hairdryer/ grab bars in bathroom/ clock radio/ free local calls/ and wake-up service. An iron and ironing board are available upon request. At Americas Best Value Inn Montezuma/ We-ve Got You Covered from the time you hit the road until your head hits the pillow. 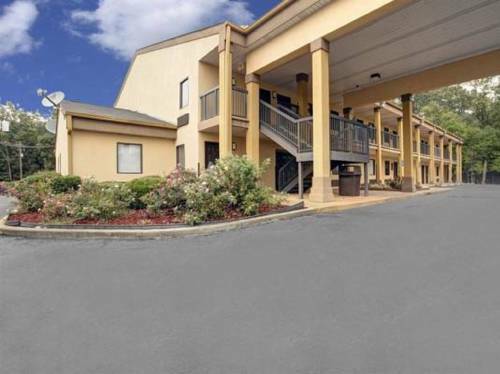 Americas Best Value Inn Montezuma is conveniently located off of GA-224/ GA-26/ and GA-90. Our address is 520 Spaulding Road/ Montezuma/ GA 31063. Its threat of nuclear obliteration tamed for now, an old missile stands next to a fast food restaurant and the freeway, defending what we hold dear.